Today in HRU a bettor looked at the benefits of betting harness racing. Making money is fun, and losing money, even if you had a nice souvlaki sandwich from a food truck, or laughed at the wiener dog races, is not so fun. Making money, or having a chance to make money, is why people come back en masse. Harness racing might not have the complexity or cache of Thoroughbred racing, but it does have a lot going for it. You do have a chance to make money. If someone ever asks you why they should bet harness racing, here are a few reasons you might want to share. Any game we play with horses, or dogs, or hold em poker and others possesses some area that gives one an edge. Harness racing still has a few of those left. Tonight is a major stakes night at Mohawk, with over $2M in purses being handed out in some big races. Here is a free program link. Happy Friday everyone, on the lead-up to the bittersweet long weekend that serves as the unofficial end of summer. This Saturday evening there's a fantastic racecard at Mohawk Raceway. Several stakes are slated to go, including the $680k Metro for two year olds and the Canadian Pacing Derby for older pacers. Each year this big day kind of stumps me. I don't know if it's because we have fatigue from the summer stakes season, it's just not promoted well, or whatever, but there is always a lack of buzz for this event. And, really, it doesn't make much sense considering the Meadowlands each year is closed, and there is not a lot of good harness racing against the evening. Here are the entries, and I will link out a free program when I find a link. H/T to Equidaily, here is a story on dog tracks wanting to decouple the gaming from the racing in Florida. Things like this should never be glossed over by those at smaller slots tracks - thoroughbred or harness - who just put on the races to put on the races. This is always interesting. In harness often times we do see a race that has six or seven speedballs, and we call for a hot pace. However, the trainers and drivers aren't stupid, they see it too, and react. In thoroughbred racing it is slightly more difficult to dictate how a big early horse races, but I bet you could count on more than one hand when a speed horse is strangled and a pace brouhaha does not develop. Looking at a long term database I have seen this from time to time. Races with a hugely early race shape often provide one with a winner that takes the race gate to wire, or shows speed, and pays alright. The crowd underbets the speed horses, overbets the closers, and when one speed horse does not go hard, you're left with a speed winner whom is underbet. Fascinating, I think. 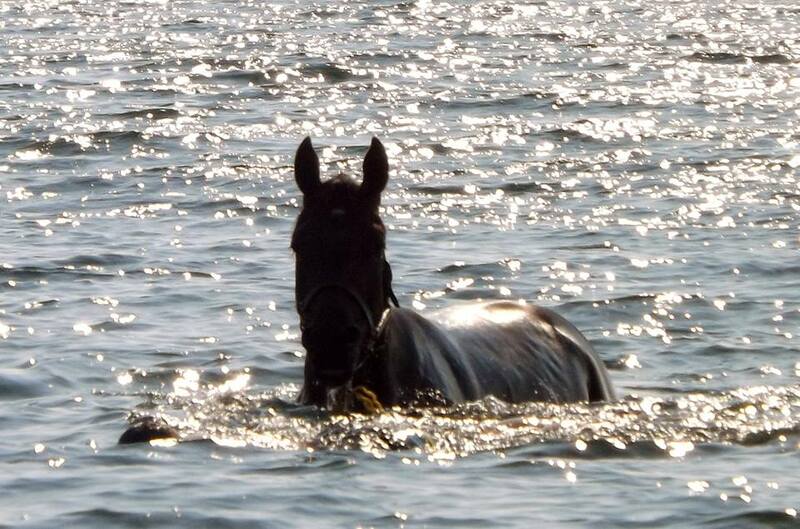 I posted a few pics on twitter this weekend of a trainer and friend swimming one of our horses, in the ocean. He says they like it, the ocean is not far, and it's something they've always done. I thought the pics were cool, especially the disbelieving boater in the last one. Have a nice long weekend everyone. 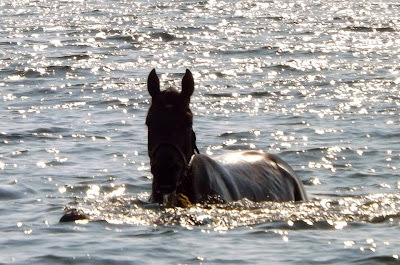 Racing Truths - "My Horse Needs 'This' Trip"
It's pretty common. A horse has some success with a certain trip, or fails with another, and his or her career can be dictated by instances. Today in the DRF, trainer of Bolt The Duer, Peter Foley, saw his horse last year get beat a couple of times on the front end, only to come back and win from the pocket. That made him a pocket horse. And this year a pocket horse he was, until the last two races. One was a world record, wire to wire, and one was a Canadian record. Boom, just like that he's good on the front end. Reviewing Bolt the Duer's race record one wonders. He won the Hempt elim gate to wire in 148.3. He won a KYSS wire to wire in 150, with a last quarter of 25.3. He got beaten a nose and a head trying to take two other races wire to wire. He's a good speed horse, hell, he's probably a good closer. A couple of 'bad days' maybe when he had a bad week, his feet were bugging him, what have you, changed the tactics for a career so far at 4. It's not Peter Foley, it's not Mark MacDonald, it's the way we in racing do things. I remember even the great Somebeachsomewhere was called a "speed horse" and from people who don't like him (for whatever reason) he was called a "speed rat" for not appearing to settle and dig in while getting beat in the Meadowlands Pace. He was 'unable to race from behind or off a helmet'. Strange yes, because he was on the front end so much because he was two seconds the best. He also won from off the pace at Grand River at two, circling the field. Finally, near the end of the year at Yonkers, he raced first over the whole mile, hooked wheels and still won. That "speed rat" was not exactly a speed rat anymore. It happens with good horses and with bad horses or with good trainers and bad trainers. We pigeon-hole horses based on one or two races, and it takes time to change the way we think of them. I remember buying a three year old out of a mixed sale in August of, maybe 2004. He showed a line where he stopped on the front end, and one where he closed on a half mile track. We had him race once off the front end and he stopped. That was my cue - "he's a closer and we want to be nowhere near the front'. It did not matter he was off three weeks before his failed front end effort, that he was not fit and we were figuring him out. He was a closer as far as I was concerned. His next race he won by five wire to wire (with me mad at the driver for leaving). He raced 141 times for us and got 12 victories - all were gate to wire. We even put him in the 1/8 of a mile sprint at Georgian Downs and with a better post he would've won easily (he had the rail and its almost impossible to come off the turn with speed with the rail for a 11 second race). He was the quintessential speed horse. I find it is even worse in Thoroughbred racing. At least in harness racing you can wait a week or two weeks or three, and have three races where by a matter of necessity a new trip happens. In Thoroughbred racing a potentially good speed horse can be strangled for four starts that take 6 months. You can't learn a mistake quickly. We often hear "he needs a helmet" or "he needs the front end". Often times it's simple happenstance and an excuse. The majority of horses that possess world class talent can race from anywhere. It's why they are world class horses. NBC released its overnight ratings for Saturday's Travers and they were a respectable 0.7. Comparing that to another niche sport, for a niche event, the ratings for Usain Bolt at the Track and Field Championships were a 0.7 on the main network last weekend. I checked Google Trends, for a lark, to see if the Travers had enough searches to learn anything at all. I doubted it would, and it didn't, but the east coast bias for the event was da bomb. It's not too surprising New York got a 100 rating, but Massachusetts at a 95 was a bit of an eye-opener. New York snowbirds were alive and well in Florida, perhaps? It is nice to see the keyword "Travers Stakes" trending over time, especially in horse racing, which has had its share of customer troubles since early this century. It was reported yesterday an out of state 5% betting tax was passed in New York state. The tax, which on a signal fee of say, 10%, equates to a 33% increase, will only affect New York bettors. This is short-sighted, and something all-too-familiar in racing: The people in charge have no clue how we bettors operate. Joe is from Brooklyn. Years ago he played at the OTB and churned about $10,000 a year betting the ponies. He, like most of us, was constantly broke and horse racing was simply a hobby. Then one day Joe discovered ADW wagering. He signed up with a place that offered him back cash rebates for his play - just like Vegas gave to Ernie Dahlman that made him move out of state in the 1990's. With a signal fee of 10% to pay the track and horsemen, and rake of 21%, the ADW kept three points for themselves for operating expenses, with the other 8 points going back to Joe from Brooklyn. Joe then noticed a funny thing happened. He was betting his usual $100 a day, but at the end of the month, instead of being broke, he still had his original bankroll. He kept playing, and found out that over time he could bet more each day, and instead of playing three times a week, he was playing five. Joe became what racing wants and what he wanted for a long, long time: An every day player. Rolling over that rebate, Joe was betting more and contributing more for purses than he ever had in his lifetime. Racing was enjoyable. Now, with a 5% tax on his bets, his takeout reduction dries up. The ADW - working on razor thin margins already - has passed the tax on to him. Joe figures it's no big deal and he continues to play. But a not-so-funny thing happens, at the end of the month he's broke again. He's back to where he started. Joe gives it awhile but being back to where he was is a step backwards. He still likes racing, he still wants to watch the Kings Bishop or the Travers. He just doesn't really care to bet on it. At that point Joe's tenuous relationship with racing has reached a tipping point. Joe has two choices: Try and find someone in another state to sign up to an ADW for him and play that way, or leave racing and move on to something else. Joe is not "greedy". Joe did not get a bad call from the Saratoga stewards and he's pissed off. Andy Serling did not yell at him on twitter, nor was he shortchanged by a teller, or was served a bad hot dog from a surly Aqueduct waiter. Joe is just doing something we all do as a consumer: He is exhibiting perfectly rational economic behavior. The pizza place down the block he used to enjoy made it harder for him to enjoy it, so he switches pizza places, doesn't eat pizza as much, or orders Chinese food twice a month instead. It's really as simple as that. Someone in racing might read this and say "give me a break". If they are saying that, they do not understand betting customers. This is as right as rain and perfectly accurate. You just have to be a real customer who tries to bet this sport each day to know so. What's most maddening about New York's short-sightedness and lack of understanding of customers, is that the state is a slots state. Bettors have been asking for years that when slots are passed some of it is passed on to them so they can enjoy the game more. New York is not passing it on to them, they're doing the exact opposite. For many players they are raising their prices. In Ontario recently the transition panel mentioned the horseplayer 29 times in its preliminary report. The government chastised the business for not taking care of customers with billions in slot revenue. You'd think New York would take heed. Instead they chose to screw Joe from Brooklyn and the thousands like him. I guess it's what we expect and why so many of us are flabbergasted at the sport. Handle in 2014, if it just grew at the rate of inflation since the year 2000, would be around $20 billion. It will probably be half that. People have been communicating their distrust and dissatisfaction for a long time. We just see far too much of the above; seemingly over and over and over again. I was recently reading the story about the fellow who stole the ambulance at Del Mar, went the wrong way in the stretch, and caused quite the fracas at the seaside oval. So far the details have been sketchy. Coincidentally, I open my email this morning and it's from Cub Reporter, the no-holds-barred underground gumshoe journalist, who from time to time has the inside scoop on such matters. He did not disappoint. He asked me not to reprint his work, but as usual I publish his work for you here. Much has not been released about Saturday's stolen ambulance situation at Del Mar Racetrack. Cub Reporter has been working the phone, the email, the SMS, the tweets, the instagrams, the facebook, even the Myspace and the Usenet to find out more. "I took it", said former minor league baseball star, serial emailer and horseplayer advocate "Racetrackandy". "I wanted to highlight the stewards this meet. They've been not calling fouls, calling phantom fouls. I think they've done a poor job for horseplayers and I want the world to know", noted Andy. "If you notice I swerved and took out the stretch pole, then I opened the back door and released a stretcher which interfered with the outrider chasing me. Look at the board. They didn't even put up the inquiry sign. Another thing I found was that when I was on the inside the ambulance drove like a song, when I moved into the five path it was like I was stuck in sand. Del Mar should go back to dirt"
"Anyway, this is why I was not on twitter all day Monday. Just sayin'," he said. When asked for a comment, a Del Mar spokesman said, "Although we encourage good clean fun, like Miss Cougar Contests, next meets Miss Extreme Cougar contest, and other contests with chicks, we found this an overstep. We're proud of our track biases, stewards and what Del Mar stands for. We support our ambulance and the community." Joe Drape, on the scene covering the story for a new piece called 'Disarray at Del Mar, Mangled Ambulances' said. "We're going to have to look at getting the Fed's involved in regulating ambulances at racetracks. It's obvious. This sport cannot police itself." Others were no so sure this was even a story. Contacted in Austria at a press conference announcing tax credits for the poor if they buy Frank's Energy Drink, the King of Magna said, "Who's Racetrackandy?" The CHRB head just said, "F#)@)#, f#)$)@ Andy." Others had some agreement. A bespectacled anonymous trainer concurred on the dirt part. "Far be it from me to agree with Andy, but yes, we should be going back to dirt. The path Andy chose proves it. We need a fair, unbiased dirt track like Santa Anita." he said. Sitting with him, a large California owner nodded in the affirmative. He was unable to speak because he was eating a whole bunch of McNuggets. 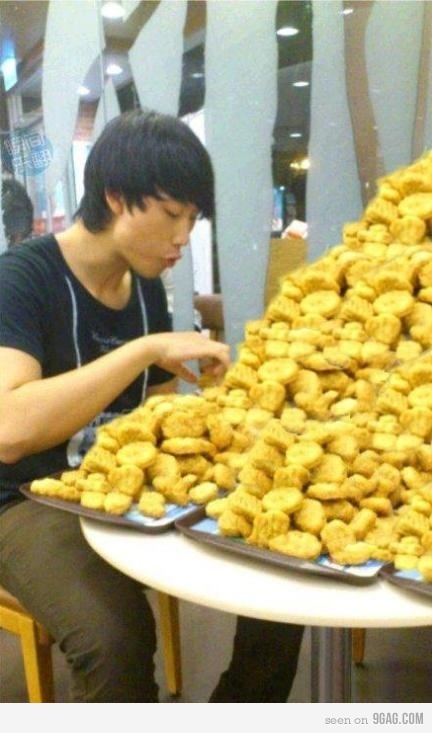 Man, that dude loves McNuggets. I've never seen anything like it. When asked how the dirt track would be put in, it was suggested that the Players Pick 5 low 14% takeout be doubled to make "double the money". "ANDY DID NOT DO THIS. IT WAS A SET UP FROM THE TOC. 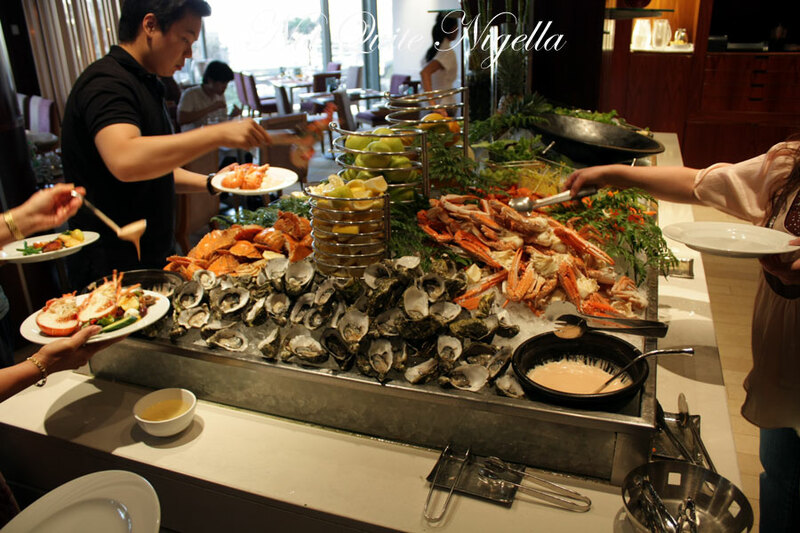 AT A LAVISH PARTY THEY HELD RECENTLY WITH KING CRAB, FRESH ALASKAN SALMON AND CAVIAR, A PLAN WAS HATCHED TO PUT ANDY IN THE SLAMMER. WE'LL GET TO THE BOTTOM OF THIS AND HEADS WILL ROLL." said my source. Cub Reporter will stay on this story. Until next time. Good luck and good racing. So long from Del Mar. Many years ago when I started playing racing in a serious fashion, one of the most difficult things to do was manage a bankroll. I remember as a student working the summer at a meat packing plant. I'd be in at 7AM and out at 3:30, head home on the subway (while reading the past performances); getting ready for an evening of racing. I was making okay money at the union job, but I was also using that to bet. I'd walk into the track with my $50 or so, and that was my bankroll, my food money, hell, it was my subway money for the next morning. Managing $50 and betting in any type of optimal way was impossible. What would continually end up happening was me making a run to the ATM, when there was no money in the ATM. It made racing completely frustrating. I was picking great horses, but I was broke all the time. One day I entered the track after a day of work and made a nice score. I got lucky on a horse I had been following and I think I made upwards of $6,000. At that point, after I paid debts, set aside $2,000 for tuition and books and another $2,000 for regular living, I had about a $1,500 bankroll specifically for horse racing. Playing with that bankroll was a blessing. It was the first time I ever had one, and betting properly (I knew how to bet properly, I just never could put it into practice), was something I knew needed to be done. My betting life that year was much different. I knew I could bet $30 to win on something I liked, because $30 was not out of my rent money, it was 2% of my betting bankroll. I could take a pick 4 for $24, because it made sense to. Every handicapping book you'll ever read talks about playing with a bankroll that is not money in which you need to live. It's set aside money, entertainment money, money you don't need. Those books and authors were not blowing smoke, they were completely and unequivocally right on. In this day and age (if you are a weekend warrior, or thrice a week player) there is no excuse for not playing with a bankroll. ADW's are built for it and they are an amazing tool. They keep score for you, show you what bets you are good and bad at, and allow you to calculate bet sizing accordingly. Playing a bankroll in them (or with a players rewards card on track) are a godsend. Why is playing with a bankroll so important? Instead of walking into the track with $100 and hoping to hit something by betting $10 WP and $24 in supers in the first race (44% of your bankroll), then reloading at the ATM, think of how much better it is if one walks in with $1,000 you saved up to play. $44 out of $1,000 is 4.4% (still too high a bet size if you are betting anything longer than non-chalk) but it takes the pressure off. There is no frustration with getting beaten a head. You have upwards of 96% of your bankroll left. $1,000 might sound like a lot of money and for many people it is, but think to yourself how many times this meet you reloaded. I bet for a lot of people it totals way over $1,000. You're starting bankroll on a Tuesday is always bigger than it really is. You're much better off starting with $1,000 and working from it. When you play with a proper bankroll, and bet size right, it allows you to think of your money not as money, but as a way of keeping score. Over time you will change from thinking this money is money that's lost (horse racing is hard, and most people think if they bring $100 to the track it's gone), to money that has some return. If you have $1,000 as a bankroll and roll it over 8 times, you bet $8,000 and you are (unless you are betting one trillion to one shots) going to get something back. In the long run, if you bet win only with any skill whatsoever, your $1,000 should only lose the rake, or end up at $750 or so. It's not lost money and knowing this allows you to bet with more confidence and less distraction. When you play with a bankroll and win, say, 5% over a long period of time, you learn your edge. Knowing you have an edge's importance can not be understated. When you lose by a jock strangling a speed horse, get knocked out in an inquiry, get beaten by three noses in a row, you know in the long run you are going to win. This frees your mind from the thoughts that befall 98% of horseplayers: The seeds of doubt, the frustration, the bad feelings, the overbetting, the going on tilt - those things get slowly put on the backburner. You start to care less about the instances, because you know in the long run things will work out. Playing for a long time also makes you a better player. You bet size better, you bet better, you get better. You learn to maximize that edge and you put in the work needed to increase that edge. There are a lot of public handicappers, I am sure, who have a five percent edge that end up broke at the end of the year because they don't know how to bet. A consistent betting bankroll, even with a small edge, can mean the world to you as a horseplayer. Horse racing is a brutally difficult game. 98% of the people - battling high rakes - can't make money at it at the end of the year. A lot leave in frustration. If you do not set the table to be a good player, you will never become a good player, in my opinion. Making sure one has a proper bankroll, and managing that bankroll correctly can add to your enjoyment. And who knows, at the end of the year you might have more money than you started with. 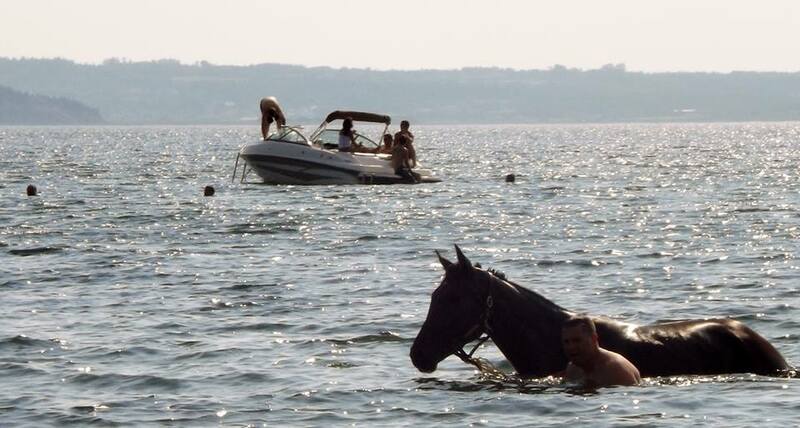 At Saratoga Is More, More? This past week the DRF's Steve Crist penned an excellent column titled "Are there too many races at Saratoga?" Proponents of the more-more-more position say that in the absence of a law requiring patrons to bet on every race, why should anyone object? If nine a day is your limit, you can always skip a few, and why deprive those who can’t get enough of getting a few more? The more-is-less advocates say that the extra races dilute the overall product, making Saratoga less special and some afternoons more reminiscent of Aqueduct than Ascot. Eliminating the two or three worst races every day would make the meeting shinier, cut down on the workload for handicappers, and those who can’t get enough can always play simulcasts. Steve then goes on to talk about the relationship, pre slots and takeover, between the state and NYRA. This, whereby NYRA had to show revenue gains, and the easiest way to do that was by lengthening a solid meet like Saratoga. This is really nothing new. Years ago, at the end of a 162 game season, the winner of the National League played the American League winner. There was no inter-league play. The Fall Classic was the Fall Classic. In the NFL, the road to the Super Bowl was a quick road, not a circuitous trip that takes place from December to February. MLB and the NFL did not choose those changes for any other reason other than money. If too much of a good thing brings in more money, then it's not too much of a good thing. There's no reason to wax poetic about it. However, horse racing is a sport, yes, but it is a sport that relies on gambling, which relies on churn. It's a bettor participation sport, or as my friend Eric Poteck calls it "Gambletainment". Just like in the 1970's when Vegas had a monopoly on many forms of gambling, they could not just set up slot machines at 25% rake and expect people to come back; people needed to win something, sometimes, to come back, and they needed to be entertained when they weren't winning. Vegas evolved and offered lower take (some slot takeouts fell from 25% to 2%), new games like low rake poker, and many other activities to try and keep people engaged. Your money might be vanishing, but it's at least lasting longer, and hey, you saw David Copperfield make a bus disappear. 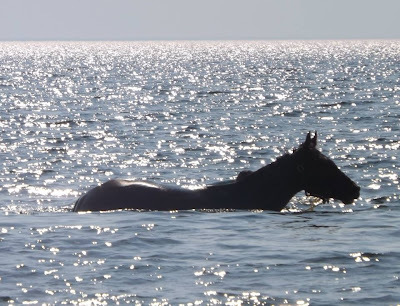 At Saratoga, if you hit people with tough races, many races per day with deep fields, super-long meets, less compelling racing, and charge a high rake, will they, over time and in the same or higher numbers, come back each year? Maybe, or maybe not. It's a question that might take a decade to answer. NYRA and the State are doing what any one of us would do if we were in their shoes. People complain about state bred races or turf sprints, but they're betting state bred races and turf sprints at a level they don't do at any other racetrack. Perhaps the pull of Saratoga - the tradition, the setting, the habits and all the rest - will trump most of what's thrown at patrons. Perhaps it's too big to fail. In the here and now, it certainly appears that way. What tomorrow brings is anyone's guess, but I believe it's something that any good business has to pay attention to. It's pretty tough to be a bettor or a complete racefan when Saturday starts at around noon and ends at after midnight, but yesterday was pretty exciting. I will spare the details regarding the Arlington Million day and the DQ, or my big bet against Princess of Sylmar in the Alabama ("I'm sure she's not winning", said Pocket), and concentrate on a little harness racing. For the racefan in me, I watched a little bit of the Gold Cup and Saucer card, as I usually do. The spectacle - from the singing of the island hymn, to the spotlight post parade where you can see the passion in the local connection's faces - is always neat for a fan. We, in any type racing, do not see anything like it. The race itself was a barnburner with Carl Jamieson parking out the 2 horse, the 4 horse and horses that weren't even in the race, it seemed. This set up a come from behind win by Escape the News in track record time.Watch the video, the race was a blast. I watch the Preakness as a fan, but the fans there seem to be running urinals or listening to Maroon 5. At the Derby there are a lot of fans, but a lot of them could not even tell you who Todd Pletcher is. At Charlottetown the vast majority of fans could tell you who sired the dam of the four, who trains the six, and who won Gold Cup and Saucer 48, all without looking. It was a nice night to be a fan in a neat part of the racing world. The big news, in a night of big news, was the defeat of Captaintreacherous. So far the Captain has been in the Captain's seat most races - second over, on an easy lead etc - but this night it was not the case. Sunshine Beach, a capable and willing foe, had rail control and that proved to be the magic elixir. The Captain was his usual game self, but he needed another half a foot. There's no disgrace in that defeat. That's a good horse. The tables were turned on Hambo champ Royalty For Life, as Smilin' Eli assumed rail control and parked out the big horse. Spider Blue Chip was the beneficiary. I notice on a chat board driver Tim Tetrick has been monikered "Boots" Tetrick. This sport at the highest levels is still winking and nudging, but the customers notice. They're not stupid. The kinda sad story for me this year was the non-development of Wheeling n Dealin'. He lost again last night off cheap fractions. Dustin Jones is one of the good guys in this sport and deserved better. I'm not sure about the two year olds this year, but one two year old that's got it is Precocious Beauty. The Art Major filly stormed Mohawk in 150.2 and could've went faster. She'd probably be the favorite in the Metro. Bolt the Duer went a huge trip over Saratoga last evening, stopping the clock in 149.1. Last season Bolt had some feet issues at times, but he's always been a dandy animal. It was kind of funny to see him take that gate to wire. A lot of times last season - by mostly happenstance - he raced better from the two hole. That seemed to make everyone think he needed that trip. That horse is fine from any trip. The Gold Cup and Saucer card with a big attendance, handled $272,000, which is good. It shows that attendance at a track should garner revenue from admission, however. On-track bettors do not send it in. The best tracks have lower rakes, bigger pools and good racing to entice simulcast bettors, and a great on-track experience to grow the base and bring in money that way. It was a fun betting day yesterday for me. I am at the beach this weekend and it was an awesomely nice day, so I played in a bit of a fun mode. I still made proper bankroll sized win bets and so on, but it was more casual. I continue, though, to be a discerning bettor when it comes to rake. I did not play Pocono seriously, because with those takeouts they don't take me seriously. I did not play the 25% rake pick 4 at Arlington, nor did I really look at playing any stout bets at CDP for the Gold Cup and Saucer. Betting seriously for a long time now gets one into habits. Some of them that are bad need to be corrected. Good habits - betting where you have an edge - are habits I am happy to have. Win or lose, at least I know I gave it my best shot. Enjoy your Sunday everyone. I hope your weekend has been profitable and fun. A trainer has been found not guilty of fraud and cheating at play by an Ontario judge. This is believed to be the first trial of this nature in Canada. That headline might not sound too thrilling, but how he was found not guilty will certainly rankle you if you are a bettor. Though he [the judge] accepted the prosecution’s claim that Riesberry attempted to gain advantage by injecting a horse Sept. 28, 2010 with performance-enhancing drugs and intended to do so again Nov. 7, 2010 when he arrived at Windsor Raceway with two fully-loaded syringes and a horse in tow, Rogin couldn’t find that the public was either cheated or defrauded by the action. Drawing on numerous precedents on either side of the border, Rogin essentially ruled bettors are observers not participants in horse races. The bolded part is mine. I know I am an observer of football games, I like to look at the stars sometimes, I also observe TV shows. When I was younger I observed pictures the articles in Maxim magazine. But when I bet $400 on a horse race, I sure as hell ain't any observer. Pari-mutuel horse racing is betting 'amongst ourselves'. It's very similar to the stock market. I wonder if this judge would find a publicly traded company not guilty of fudging the books because investors are simply "observers'? The next person I meet who isn't dumbfounded by this decision will be the first. I was surfing the web last week and came across an ad on Equine Now for the drug ITPP. The rather creepy looking drug that is long-banned was brazenly being advertised for all to see. As if a picture and description wasn’t enough, this “reputable” business also lets you know in the ad that they sell “party powders, bath salts, and pills”. Wonderful. Not only do we have to look for their products on backstretches, but in America’s neighborhoods, too. We’ve read stories the past few weeks here in Harness Racing Update and elsewhere about Jeff Gural’s new initiative with a hired investigator, and the problems some have with it. I agree with some of the criticisms, but I must say after reading that ITPP ad it got me to thinking: This is what Jeff Gural is up against. I think his plan to add a deterrent, any deterrent, whether it be out of competition testing, investigators, barn searches or good old fashioned police work can help. Or at the very least it certainly can’t hurt. Cycling has played a cat and mouse game with drugs like this for many years. They tested, and tested, and interviewed and interviewed. Cyclists were mum and the tests were always one step behind. In addition, there was no way to test for a blood transfusion, causing even more consternation for the sport. Modern cycling, as the Lance Armstrong affair pointed out, was pure poison. Over the last several years cycling began to tackle the problems differently. Yes, they developed an EPO test, not unlike the one used in racing, but they also added a biological passport. According to Sportsscientists.com, the biological passport concept “is that regular measurements of certain blood variables, like the percentage of reticulocytes, hemoglobin, and a calculated score called the Off-score, can point towards blood doping. The principle is that it is possible to detect the effects of doping without ever having to find the drug." Through out of competition testing, a profile of each rider is constructed, and any huge peak or valley triggers an investigation. There was no guilt, no smoking gun, but the riders knew that someone was watching. This graph shows completed tests in cycling since 2001, broken down in several ways. The green bars represent the probable presence of EPO. The pink bars represent blood doping via a transfusion. As you can clearly see, in 2001 and 2002 the bulk of samples indicated EPO. In 2003, directly after an EPO test was developed, the green lines were replaced by pink ones. It’s surmised that cyclists changed their behaviour from EPO to transfusions in response to the new EPO urine test. What perhaps is most interesting is that the gross number of potential dopers remained virtually unchanged after the EPO test was developed; these riders just moved on to something else illegal. Then in 2008, in came the blood passport. Both EPO and transfusion positive indicators fell precipitously. Because the riders had nowhere left to turn, no matter what drug they used, they had to stop. In three separate instances, cyclists changed their method of operation, and it seems to have gotten to the point where the end is finally near. Not only are there fewer and fewer cloudy tests, cyclists are no longer being silent. Racers like Tyler Hamilton and Floyd Landis, along with a reluctant Lance Armstrong, have told the world their stories. The passport not only has reduced drug use, it has started to change the culture. This progression has not seemed to come full circle in racing like it has in cycling. If bad trainers were using EPO, maybe they could switch to Aranesp. After EPO/DPO testing had been perfected, maybe then they could switch to ITPP. Maybe tomorrow it will be something else. It’s still heavily cat and mouse. Out of competition testing and blood passports would probably help close this circle, but some horsemen groups seem to be against this ideal, in an “us versus them” brotherhood of sorts, which is curious since everyone should be on the same side with this issue. Some farms are not overly happy with an investigator on the grounds, too. Unlike in cycling, there are clear, concise roadblocks. Jeff Gural does not have a multi-million dollar budget, nor does he have the finest scientific team on earth working up in Pegasus in a secret lab. He does not have the backing of an industry or horsemen groups. He doesn’t have a blood passport to encourage clean racing, but he does have an investigator and a will. I suspect that he is hoping that adding another arrow in the quiver will help change behaviour – just like the biological passport does - whether a farm stands by him or not. I suspect he’s hoping that if someone wants to race at the Meadowlands who is doping, they’ll go somewhere else to race. I suspect he’s hoping that if it works, other track owners and jurisdictions will follow suit, and the game will get cleaner. I say good for him. Without a blood passport and a sport willing to get its hands dirty and air its laundry for all to see like cycling has, it’s all the guy has left. This sport should be behind him.